Most of my input, discussion, and thought on the financial system is in German, but this page lists quite a few English sources as well. This whole page is not an exact translation of the German original, but uses different quotations and gives different (and less!) recommendations for further reading. Something must give when the mathematics of interest-bearing debt overwhelms the economy’s ability to pay. 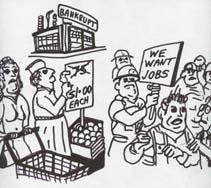 For awhile the growing debt burden may be met by selling off or forfeiting property to creditors, but an active public policy response is needed to save the economy’s land and natural resources, mines and public monopolies, physical capital and other productive assets from being lost to creditors. What happens when you lend out (“invest”) a certain sum of money at a certain interest rate? The amount of money grows, just as “on the other side“ the dept - and that happens exponentially! Here are some examples that I created with a spreadsheed application: what happens with $100, when you lend them (out) for a specific time at a certain interest rate? Your web browser is too old! With version 9 (2011?) even the Internet Explorer can finally do what other browsers like Firefox, Opera, or Safari can already do for years: display SVG. As you see $100, “invested” at a (up until recently) modest interest rate of 5%, would become more than $13,000 after 100 years. Calculating with an “annual rate of return” of 10%, like some investors and CEOs do, these $100 would have become $1.4 million! 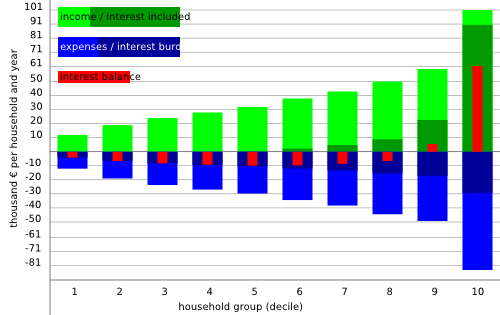 The doubling time, which is given in my table’s last row, is less than 8 years at an interest rate of 10%. If you know about binary numbers, like any mathematician or programmer would, you know the powers of two by heart, i.e. you know what repeated doubling means: times 2, times 4, times 8, times 16, times 32, times 64, times 128, times 256, times 512, times 1024 (after doubling 10 times), ... the growth “explodes“ and soon excesses any imaginable dimension. According to a combination of available data, estimates, and calculations more than 250 billion € are annually redistributed from the “poorer” 80% to the richest 20% of Germany´s population! The main argument in this calculation is: the interest the well-off receive has to be earned by someone and thus must be part of all the product prices. 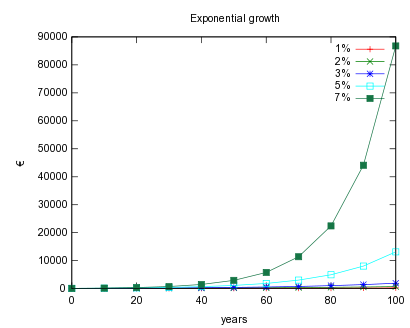 Today this interest component already amounts to an average of about 35% and when the assets (the capital) double (which is bound to happen at some point, as shown above) the interest component will have risen to more than 50% - of course only if no counter-measures are taken. My Redistribution Calculator allows everyone to experiment with his or her own values for capital and interest! Money requires the State, without a State money is not possible; indeed the foundation of the State may be said to date from the introduction of money. I chose this quote to show that the existing (i.e. produced by the European Central Bank, the Federal Reserve, or their respective counterparts) money needs not be accepted as “natural”. In fact it is just an agreement between men, which can be cancelled or modified. I pin a lot of hope on a new money like the “Freigeld” Silvio Gesell describes it his book The Natural Economic Order. The full text of the book seems to be available online in English, French, German, Spanish, and Italian. If Germany had a working circulation safeguard (Freigeld), the redistribution of money from poor to rich, as displayed above, would no longer exist. Instead there would be a slight redistribution from those holding a lot of cash to those living on less money. 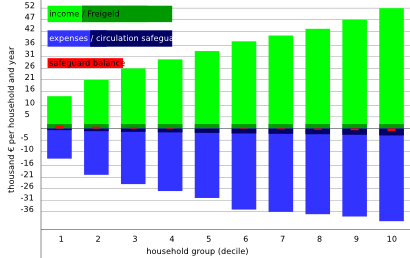 With my Freigeld Calculator you can immediately start playing with different values for the circulation safeguard! I hope to be able to make this operational as soon as possible - or for someone else to implement the concept! inequality.org provides very telling graphs on wealth inequality and income inequality in the US. Cyclos maybe already approximately provides what my Freimarkt is supposed to become: an internet market place with its own (optionally) circulation safeguarded currency. Several instances, but mostly small, regionally linked, and not open to everyone, already exist. Tim Beam - The Ghost of my Money A video with nice pictures from the not too exciting movie „Der Geist des Geldes“ (The Spirit of Money). Larry Han­nigan - The Ear­th Plus 5% strikingly explains why money at first was good for most people, but in the course of time made more and more of them fall into poverty. Thus our current money became the culprit for the worst of crimes, especially the constant wars. When you click the link to the story you also get to hear the text, if your computer supports sound. If English is not your preferred language there is an extensive list of translations available (albeit without the audio version): Bulgarian, Catalan, Czech, Dansk, English, Español, Francais, German, Italian, Japanese, Latvian Malay, Indonesian, Polski, Portugues, Russian, Serbo-Croatian, Turkish, and Urdu. Originally my link to this story was more prominent, but now I’m relatively convinced banks (except for central banks) don‘t actually create money, as the story states, so it has some flaws. Money as Debt is a simple but thrilling documentary on the history and creation of our current money. It probably is not totally accurate when describing how banks would create money, but it delivers nice pictures for the effects of exponentially growing assets and debt. Alternatives to the current financial world order are also discussed on the website and in the film, which is freely available for download. Let’s make MONEY (IMDB entry) a calm, shocking, and great documentary with cineastic pictures. Life and Debt - A haunting documentary on what the policies of the IMF lead to. Helmut Creutz - The Money Syndrome His book (that I read in the German original) is a very convincing and complete critique of money. Margrit Kennedy is a German professor for architecture who increasingly concentrates on a money reform. Her website contains links to books (notably “Interest & Inflation Free Money”, which is available online and which I read in German), presentations, and more. John S. Cooper - Zero the Dollar Crisis provides the setting for this 2010 thriller. According to internet sources the author is a German living in the States. The system of banking we have both equally and ever reprobated. I contemplate it as a blot left in all our constitutions, which if not covered, will end in their destruction, which is already hit by the gamblers in corruption, and is sweeping away in its progress the fortunes and morals of our citizens. [...] And I sincerely believe, with you, that banking establishments are more dangerous than standing armies; and that the principle of spending money to be paid by posterity, under the name of funding, is but swindling futurity on a large scale. Tho­mas Jef­fer­son (1743-​1826), Third President of the United States, in a letter on republican government to philosopher John Taylor.